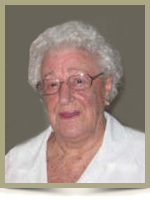 OLSEN- Hildred V. “Hoodie”, 85, of Riverview, NB, formerly of Liverpool, passed away peacefully in Dr. Georges L. Dumont Hospital, Moncton on Saturday, September 3rd, 2011 with her family by her side. Born in Liverpool, she was a daughter of the late Harry and Margaret (Chandler) Thorbourne. She worked for the Liverpool Post Office for many years. She was also a past member of the Liverpool Business and Professional Women’s Club and served as treasurer. Hoodie was a member of the Trinity Anglican Church and a past member of the A.C.W. and Altar Guild. In her later years she enjoyed knitting for charities, reading and listening to music but most of all being near her family and grandchildren. She is survived by her son Duane (Elsie) of Riverview, NB and 3 grandchildren Tiffany, Mitchell and Alyssia. Half-sister Alta (Murphy). She was predeceased by her husband Mitchell and her stepfather Arthur Freeman. Sisters Ester, Lucy, Margaret and Lina. Brothers Laurie, Bruce, Harry “Bud”, Perry, Ivan and George. So sorry to hear of Hoodie’s passing. We remember well the good times we had at the lake years ago with Hoodie and Ollie..Our thoughts are with you. Duane I will keep you and your family in my thoughts and prayers. Aunt Hoodie is now with the rest of the clan and what a time they will have. My thoughts and prayers are with you all in your time of sorrow. Sorry to hear of the passing of your mother. Extending our deepest sympathy and condolences to you. So sorry to hear of Hoodie’s passing. Spent many years working for her We got along just fine . Will miss her phone calls at least twice a month. Sorry to hear about your mom thinking of you all . Duane, when I read your mom’s obituary it brought back lots of memories for me. I along with my parents, six sisters and two brothers lived at 630 Main Street next to Turk and Mrs. Freeman. Oh and there were two dogs whowere a part of the Freeman family! My father Jack Randall was the postmaster in Liverpool during the years when Hoodie worked there. It was a special place back when Hoodie, Robert Fader, John Anthony, Audurey Dauphinee etc worked as staff in the post office. Also remember when Hoodie got married and I must say I never knew your father’s name; he was always Ollie to us. She was a very dear person when I knew her and I know you are so sad to lose her. My heartfelt condolences to you and your family. I am sorry to hear about your Mother’s passing. She was a really great lady. I had not been keeping in touch with her very much since your Dad passed away. I had popped in a few times to visit and do the odd repair but I was not aware that she moved. I will try to make it to the service on Saturday. My thoughts and prayers are with you and your family. Duane, Elsie and family – Just want you to know that our thoughts are with you at this difficult time. Duane, Elise and Family. we are so sorry to hear about your mom passing . May you have comfort in nowing she and your father are together once again. Our prayers are with you all . So sorry to hear of Hoodie’s passing. We will always remember the wonderful times we had with them at the lake and the great meals Hoodie cooked.